Indonesian Kitchen on Amsterdam’s Herengracht was recommended to me by a food journo friend, who in turn had it recommended to her by Mr Pendergast. And who am I to argue with the King of Kansas City-style BBQ when it comes to frankly anything? Besides, I’d been looking for somewhere new to send readers ever since my recent experiences at Blauw and Tempo Doeloe left me feeling slightly less confident about including them on my Indonesian restaurant recommendations list (the food at Blauw had got colder and less spicy; the service at Tempo Doeloe had got even worse than it already was). However, I probably needn’t bother: Indonesian Kitchen is already full of American tourists… and British tourists… and French tourists… In fact, I had the feeling that all the tourists had found it before me. Not that I’m moaning about the tourists as much as everyone else is at the moment. People seem to forget they are tourists themselves every time they leave home. And most reasonably affluent Europeans go on holiday at least from time to time. We can’t very well complain when others do the same. But I digress. The rijsttafel at Indonesian Kitchen costs €39.50, which seems pretty steep but then again a) you’re on the grachtengordel (rent can’t be cheap), and b) you do actually get quite a lot of bang for your buck. 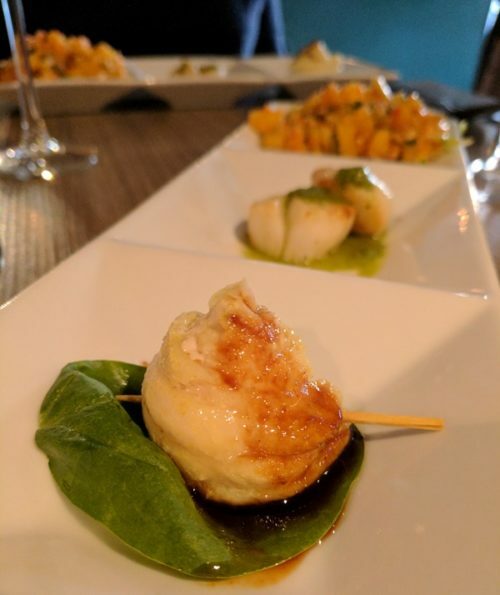 First up came a little trio of starters: fresh pineapple and peanut salad; two just-seared scallops with a green dressing that I couldn’t quite place; and an umami-rich roll of chunky fish (possibly monkfish?) with a single basil leaf. A good start. From there, we moved to perhaps my favourite course: a spicy fish soup, filled with shrimp, more monkfish, fresh spring onions, fried yellow onions, and broth that was zingy with chilli heat and lime freshness. I wanted a second bowl as soon as my first was finished. 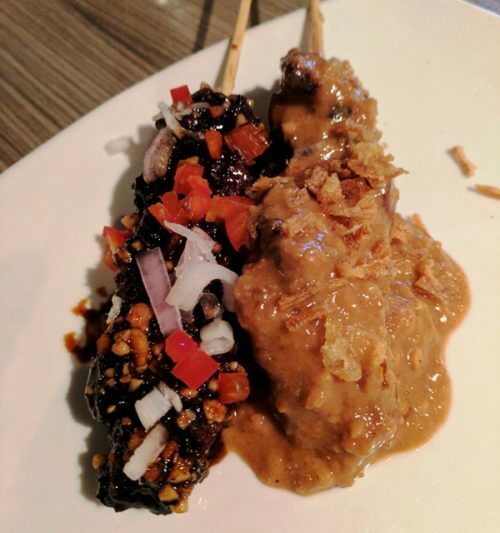 Before the rijsttafel proper, we were served two satay skewers: one made of goat and served with a sweet soy-sauce dressing; the other made of chicken and served with a classic peanut sauce. Both were the perfect balance of succulent meat and sweet-meets-savoury sauces, without being too salty or too cloying. The rijsttafel itself comprised eight dishes (I only know this because the plates are divided into quarters, so everything comes in multiples of four), including classics like beef rendang, gado-gado, and a spicy chicken curry. There was nothing too special about these, if I’m honest – the rendang lacked depth of flavour in terms of warm spices, and the chicken was missing a lot of the chilli I’d expect. 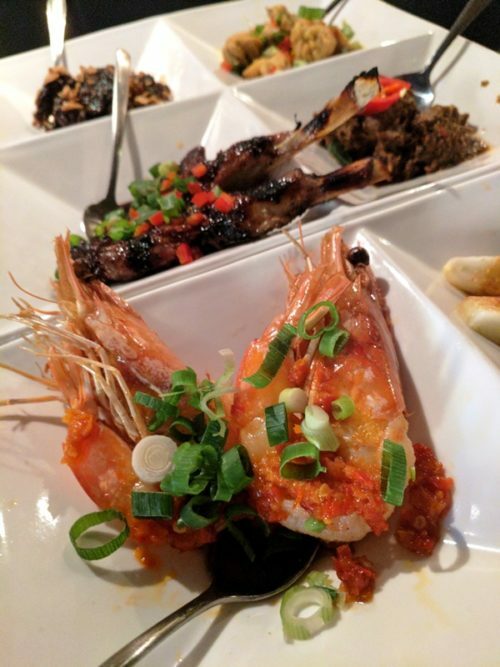 However, some of the less obvious dishes were much better: shell-on king prawns came with a tasty sambal that lent a welcome hit of chilli. Lamb cutlets were still pink in the middle and served with a sweet soy sauce much like the goat satay earlier. And a robust green vegetable (kale?) came in a peanut dressing that was mercifully devoid of the overt sweetness of many dishes I’ve eaten on other rijsttafels.